The telecom giant's bet on online advertising hasn't worked out, and the company just admitted as much. Although Verizon Communications' (NYSE:VZ) core business is having the country's "best wireless network," it has tried to break into the digital advertising arena over the past few years. Under former CEO Lowell McAdam, the cellular giant scooped up AOL in 2015 for $4.4 billion, then followed that with the acquisition of Yahoo! 's internet assets for $4.8 billion in early 2017. In August 2017, the company rebranded the combined assets as "Oath," and hoped to use them to take on internet giants Facebook and Alphabet in digital advertising. However, under new CEO Hans Vestberg, Verizon is now restructuring the unit, basically admitting that the effort was a bust. In a filing dated Dec. 11, Verizon made several announcements. Notably, the company revised down its earnings projections for Oath. When a company revises down expectations for an acquisition, it usually writes down the value of these assets on its balance sheet. How much did Verizon mark down Oath's value? A lot. The company wrote off $4.6 billion of the $4.8 billion in goodwill associated with the Oath assets, or just over half of the value Verizon paid. Goodwill is recorded on a company's balance sheet as the premium a company pays for another company over the carrying value of its assets (land, equipment, intellectual property, etc.). The latest move essentially means that Verizon thinks Oath's digital assets are only worth half of what it paid, and little more than the carrying value of the physical assets the company owns. That's not very good, and especially for a technology company, which is usually valued far in excess of its tangible assets. One may ask why the Oath experiment for Verizon ended up failing. I think one of the reasons is that the new company was cobbled together from "old" digital media assets that initially took off in the '90s, when Facebook's Mark Zuckerberg was just a boy. AOL properties included The Huffington Post, Engadget, Mapquest, and a smattering of other digital properties, while Yahoo! obviously brought in Yahoo! Finance and Yahoo! Sports properties. I think it's probably really hard to use the patchwork of properties to compete with a simple, single ecosystem with enormous scale, such as Facebook and Alphabet have. Facebook is estimated to have 20.6% of the U.S. digital ad market, while Google leads the pack with 37.1%. The current writedown likely has something to do with an upcoming third competitor: Amazon. The company has begun to leverage its huge ecosystem to lure in digital ad dollars. According to eMarketer, the e-commerce giant will pull in over $4 billion in ad revenue this year, surpassing Oath and leapfrogging to No. 3 in market share with about 4.1%. And Amazon is expected to keep growing that figure by 50% annually, giving it 7% of digital ad spend in the U.S. in 2020. In contrast, eMarketer analyst Eric Haggstrom expects Oath to only grow 2% next year. Needless to say, that's a far cry from Amazon's growth rate, and well below the digital advertising industry's projected 2018 growth rate of 17.7%. Fortunately for shareholders, digital advertising was a small part of Verizon's business. Last quarter, Oath made only $1.8 billion in revenue (down 6.9% year over year) out of Verizon's total $32.6 billion in revenue. The company is shifting its focus to be the first-mover in 5G networks, which should roll out over the next few years. In addition to the Oath writedown, Verizon announced it was buying out (aka, laying off) over 10,000 employees, which will lead to huge savings. While the exact amount isn't known, Verizon has previously stated a goal of $10 billion in savings by 2021. 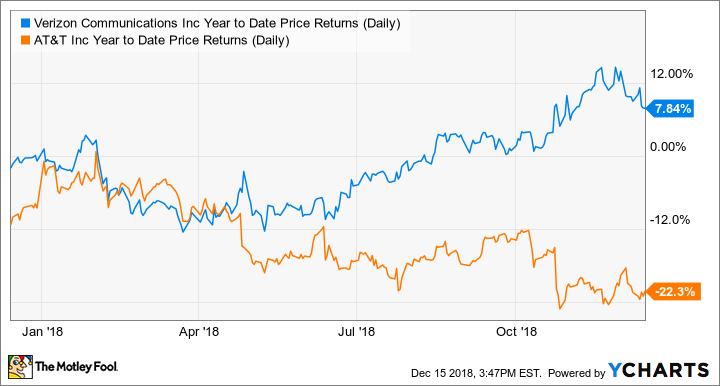 This streamlined focus on network and connectivity is being rewarded by the market, as Verizon has handily outperformed peer AT&T this year. VZ Year to Date Price Returns (Daily) data by YCharts. AT&T completed its massive acquisition of Time Warner back in June. Judging by the market's reaction, investors seem to prefer that it focus on the network over making an expensive media play-by-acquisition. Time will tell which strategy is right, but as of now, it's pretty clear that the market doesn't like ad-based media right now, unless your name is Google, Facebook, or Amazon.